There are so many tools available online to help us find our next dream horse. On top of old-fashioned word of mouth, we can likely find a suitable horse within a fair amount of time. However, if you are an amateur and need a professional eye to help you identify a smart purchase, or if you are training to meet specific show goals, you may ask a trainer to help you find the right horse to buy. Horses are expensive to buy and to maintain, and aren't always easy to sell if they don't work out. It can be wise to seek the help of an expert to assist you in identifying the right mount. Some trainers are happy to help for free. They may talk to their colleagues at a show, inquire about particular horses they like, or find you a horse within the barn. But some trainers go to great lengths to help you find the perfect equine partner. They may travel across the country or across the globe in search of your next horse, they may go and try a horse before they have you invest your time and emotions in going to see and ride it, or they may simply take the burden from your busy schedule and use any number of time-consuming tactics in helping you find the perfect horse. If your trainer requires that you pay him or her for the horse search, there are three common ways to structure the trainer's commission. The trainer would be acting as your agent and would be inquiring on your behalf about the purchase of a horse. The trainer is allowed to not disclose your identity to Sellers, but you must have a written agency agreement with your trainer to avoid dispute, to communicate the exchange of services and money, and to ensure compliance with strict agency laws. 1. The agent receives a commission based on the purchase price of the horse. Ten percent is the industry standard for agency for both a seller and for a buyer. While you likely trust your trainer, to play devil's advocate, the downside of this method is that your trainer has a financial incentive to find you a more expensive horse or to not bargain the price of a horse down. 10% of $50,000 is better than 10% of a $40,000 horse. You could negotiate with your trainer an inverse commission based on the purchase price of the horse. If the horse is under $20,000 you will pay a 15% commission to your trainer, and the commission will drop 5% for each increment of $10,000 over $20,000, and in no event will the commission drop below 5% of the purchase price (the numbers are just for clarity, import your own numbers into the formula). 2. More commonly, the trainer charges a flat fee for the horse search. The trainer likely has a rationale for the amount of time that will be invested in the search, and the time the search for your horse will take away from her lessons, her show schedule, business marketing time, or just the cost of personal inconvenience. This fee may be open to negotiation. I have seen a trainer charge a $10,000 flat fee for a horse search, which would include the trainers travel time to go alone or with you to see and ride horses (the Buyer pays for all expenses such as hotel and rental car). 3. A combination of the above two, balanced so that both parties feel they are receiving a fair deal and so incentives are balanced. For example, the flat fee commission is $3,000 for any horse purchased for under $30,000, but the commission will be 5% for any horse purchased over $30,000. Again, use your own numbers with the intent of adequately compensating the agent, but also encouraging the agent to find the optimum price for you. Trainers can often feel undervalued, and clients can often feel like an open wallet at the barn, so negotiating carefully and fairly is important. Whichever party you are in the transaction, be sure to affirm the value you see in the other party. "You are a wonderful trainer and I know your time is valuable, I appreciate your help in finding me the perfect horse." Or, "You are a great client and I'm so glad you are part of my Stable's team. I want to help you find the perfect horse at a price that is right for you, so why don't we sit down and go over the numbers together?" If you are a trainer and the Buyer is negotiating too heavily in her own favor, consider the value the Buyer will bring to your training program with a new horse, and perhaps a compromise on commission would be worth it. Or if you cannot find a compromise tell the Buyer, "I would love to help you find your next horse, but right now I am busy preparing for the summer show season and unfortunately I cannot take time away to search for your horse at the dollar amounts you are proposing. Let's work together to find a temporary horse for you for the next show, and we will re-address a potential agency after the next show." 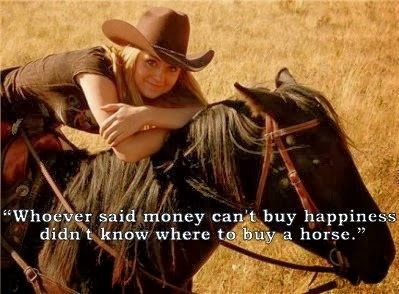 Buying a horse should be an exciting venture, though often frustrating. 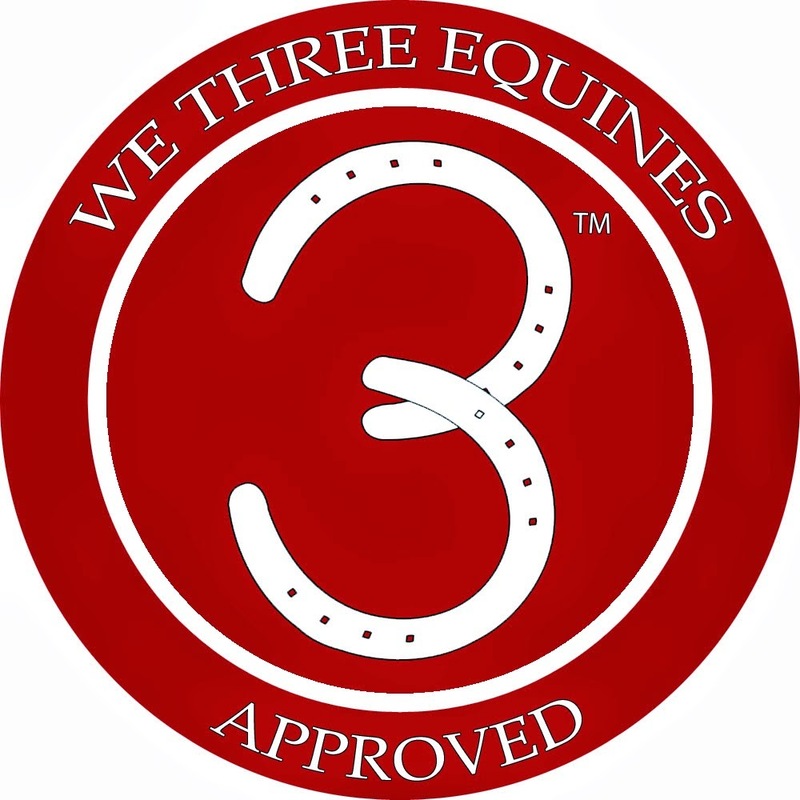 Trainers or other equine experts can help make the process enjoyable from both a time and financial position. Negotiate fairly to find an agency commission agreement (in writing!) that works for both of you. Have you ever paid someone to help you find a horse? If so, did you use one of these methods or a different one altogether? What is between a horse's ears, and is also a set of questions for you? A poll! Thank you for your feedback! I want to make sure I am serving your desire to learn and grow in equestrian knowledge in the best way possible, and your answers are so helpful to me in that process. I know that you love horses, so please select which of these topics you would love to LEARN more about! The previous horse possession post discussed what to do when an owner refuses to take his horse back from you. 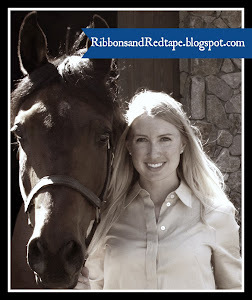 This post looks at the flip side: what can you do when someone won't give your horse back? Consider that you have leased your young stallion to a rider for free for five years, but the rider must pay for all care and training. You both mutually understand that the horse will be later be used for breeding or for re-sale. At the end of the lease you request your horse back, but the lessee claims that there are oral agreements (and multiple different and conflicting written agreements) that you will reimburse her for certain incurred expenses, and that she has also increased the horse's value from $40,000 to $800,000 (based on breeding viability) and that you have been unjustly enriched in this situation. She won't give the horse back to you until you pay her the costs that she claims are owed to her. You know this wasn't agreed to, so how do you get your horse back? Unfortunately there are not too many options. The courts typically don't like it when citizens "take the law into their own hands." For example, a landlord cannot engage in "self-help eviction" by moving a tenant's possessions out of the house or changing the locks. And entering the premises to take back your horse could result in charges of trespassing, theft or conversion, and angry interactions with the lessee that can spiral out of control. 2. Seek recovery of your horse in the court system. A preliminary or other applicable injunction compelling the return of the horse may be available; the courts would be unlikely to grant the injunction if material facts are in issue, unless you can show that the horse is at risk of facing irreparable harm or removal from the state if the injunction isn't granted. This option is sensitive to the laws of your state and jurisdiction. 3. If you bring suit against the lessee, you will likely claim breach of contract, conversion, and various other causes of action. The request for recovery of the horse is based on replevin, or there may be a relevant statute in your jurisdiction allowing recovery. In some instances you may be able to post a bond at double the horse's value with an affidavit of your ownership rights, and have the sheriff seize the horse. For any action step it is vital to have your evidence in order. Gather together the originals of your lease or other business agreement regarding the horse, your Bill of Sale when you purchased the horse, your breed registry ownership papers, show records, and any relevant email or other written communication between you and the person holding your horse. Always be able to prove your indisputable ownership of your horse, particularly when the horse leaves your possession or is involved in any partnership or agency dealings. And as my posts re-iterate time and again: prevention is everything! From my clients I've seen that one of the most helpful things to do in a long-term lease or business arrangement is to keep communicating with the person who has your horse and show up to see the horse! 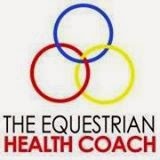 E-mail, call, ask how YOUR horse is doing and improving. Go to its shows or lessons. 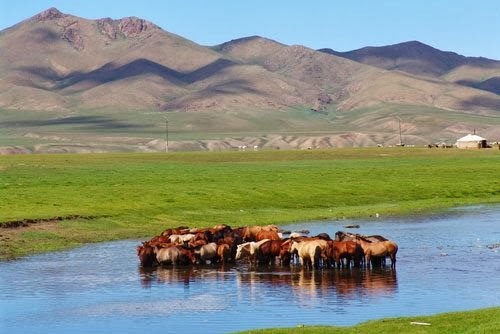 Make a goal of communicating every 1-3 months to help the lessee mentally realize he or she is not the "rightful owner" of the horse. Would you be able to indisputably prove you own your horse if someone challenged you in court tomorrow? 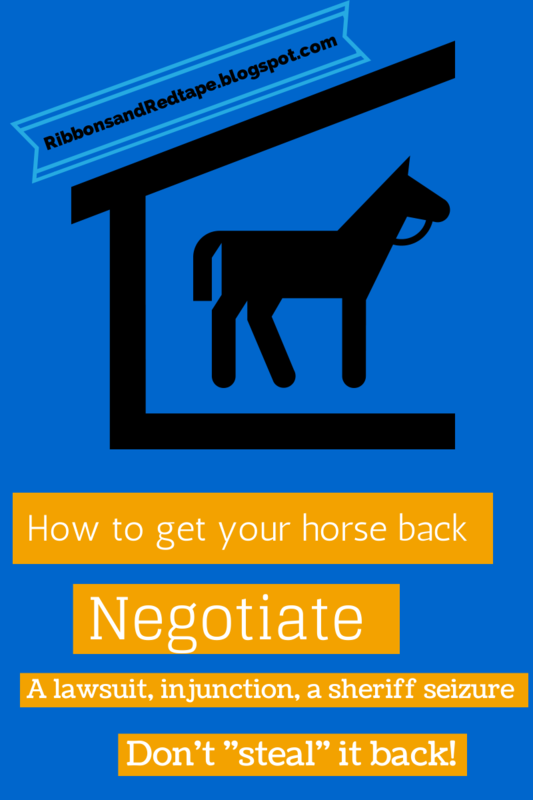 What can you do if an Owner won't take back his horse? There are two main aspects to horse possession disputes, they are exact opposites "Give it back!" or "No, I don't want it back!" but they have the same underlying reasoning. Horse possession disputes often occur between owner and lessee, owner and stable, owner and business partner, or owner and trainer. The hallmarks of the possession issue is 1) there is a dispute over money owed and the horse is used as collateral, or 2) there is conflict over who owns or has the right to use the horse. In one situation, the owner refuses to take a horse back until all alleged monies are paid in full. In the flip situation, someone refuses to give the horse back to the owner until money or possession rights are settled. This post focuses on the first situation: what do you do if the owner refuses to take his horse back? A stubborn owner can make you want to just set the horse loose. Read on for some better options! Consider that you are leasing a horse from an owner. 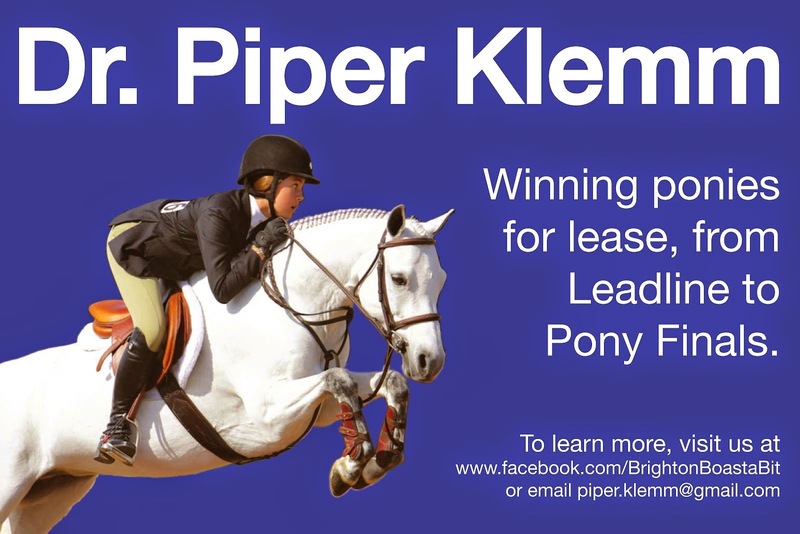 There is a one year lease agreement for how much you will pay for the horse lease, as made in installment payments. The lease agreement is vague, but implies that if something happens to the horse so that he cannot be used for the remainder of the lease, then the lease is cancelled. Perhaps lameness, injury you didn't cause, sickness, death, or other reasons. Or, maybe the lease has ended and you want to relinquish the care of the horse, and the Owner doesn't want to be responsible for the horse, but because you are not the Owner, you can't sell it. I think horses must know when there is a vague contract clause, so the horse of course becomes unable to complete the term of the lease. You call the owner and tell him that pursuant to the lease agreement, you will not be making any more installment payments and the horse needs to go home. The owner disagrees with your interpretation of the lease agreement and refuses to take the horse back. The horse is in a show barn, so you are paying top dollar show barn fees plus partial-training costs, since all boarded horses must be in training. You are spending thousands of dollars each month on high-end board and care on a horse that cannot perform, that you do not own, and money you need to put to a new usable horse. 1. Try to resolve the dispute as quickly as possible, but give yourself a timeframe of how long you will continue to care for the horse at show barn prices (for a horse that isn't fit for showing). You may want a lawyer to write a formal letter requesting the owner re-take possession. 4. If you written lease permits, move the horse to a safe but cheaper stable or a retirement or rehab facility. Depending on your circumstances you may or may not want to tell the owner of the horse's relocation. If you do, the owner may decide to take the horse back rather than have it move, or the owner may become angrier and try to get an injunction to prevent you from moving the horse, or the owner may agree to the facility change. Your defense in moving the horse is that you have a duty to "mitigate your damages" in the event of litigation, which means reducing the amount of money that you would claim the owner should pay to you for your unfairly extended care and keep of the horse. 5. Depending on your lease agreement (such as whether you can assign the lease to another party or not), the horse may actually be suitable to be a pasture pet or a therapeutic riding center horse. 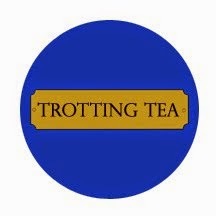 If litigation continues for a year, this could be a nice way to save some money and give the horse a suitable job. The owner could become extremely angry to not have control over the horse, or the owner may agree that the relocation is reasonable, or take the horse back. In some circumstances, you may not have a duty to volunteer the information to the owner. 4. Never act out of vengeance or anger, but clearly and reasonably address the practical and legal reasons why this horse should be moved to a different environment suitable for his condition, and continue to communicate this in writing to the owner. Clear communication and written documentation are two vital foundations of all equine law issues, be sure that in every circumstance your horse transactions rest on these pillars. It is hard to imagine someone NOT wanting to take his or her own horse back, but particularly when money and anger are on the table, it is surprisingly common. Let me know if you have ever heard of a situation like this, or which option you would might take.